The theme in these pieces is "western" where Rudy has lived for 40 years. The pieces are detailed, visual journeys that never seem to end. 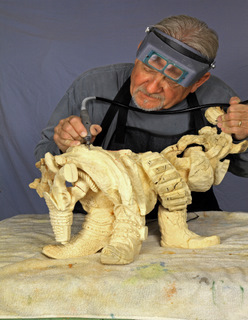 Each piece is original, unique and the level of detail requires years to complete. The finishing process includes a singular method of multiple-staining layers and sandblasting that results in a translucent finish that gives life to the subject. These pieces are not reproducible thereby defining their uniqueness. The pieces are carved from a single log of tree from Lodgepole-Pine Burlwood found only around the Wyoming area. Including the seasoning time for the wood, the time from selection to show is 3-5 years. I hope you enjoy the experience. Commissioned wood carving for doors, headboards, animals, inlays, mantles or unique pieces are accepted. ©2013 Rudy's Creations All Rights Reserved.